While iOS 7 gave Apple's mobile operating system a new paint job, but it still suffers from an age-old problem: another lockscreen glitch that could give someone unwanted access to your device. The iOS 7 bug allows a person with physical access to your phone to a limited amount of data, even when the four-digit passcode is enabled. This only happens when Apple's new Control Center feature is accessible in the locked state, as first reported on by Forbes. But since Control Center can be launched in this locked state by default, most people will be vulnerable, even iPhone 5S owners with their fancy fingerprint sensor. Testing it out, we found that launching the alarm clock app, holding down the sleep button and then canceling powering down the phone frees an attacker up to multitasking their way into the phone. All they have to do is press the home button twice. This makes a limited number of apps like Mail, Twitter, Facebook and Flickr are accessible. 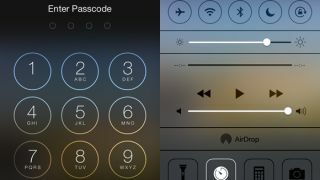 While Apple works to fix this iOS 7 glitch, worried users can remedy the Control Center vulnerability by disabling the new feature's use in the lockscreen. Navigating to the settings menu, selecting Control Center and and turning off "Access to Lock Screen" prevents this new iOS 7 exploit.